I wanted to find the perfect place for our first anniversary dinner. I didn’t search before we arrived. I left it up to Yelp, Foursquare, and other social media review sites to guide me. I mentioned one place to S and he didn’t seem all that enthused. It sounded interesting to me, but since he didn’t seem impressed, I continued looking. What was that place, you ask? Well, the Niagara Culinary Institute has a restaurant. It’s called Savor and they create your meals on display. Since we both love shows like Masterchef and Hells Kitchen, I thought it would be a fun experience for us both. I think he was put off by the thinking we would need to dress up and we didn’t bring any clothes like that with us. So, the search continued. That’s when I stumbled on Wine on Third. It had great pictures in the reviews and had almost all 4 to 5 star reviews. I couldn’t see anything bad said about this place. I made the management decision. I mentioned it, it didn’t get shot down, so I made reservations. It wasn’t far from the hotel. I knew from the photos that it was on the corner, but we were both a little concerned as we were driving there. Now, we know nothing of the Niagara area, but from what we could tell, it didn’t appear to be the best neighborhood. We could be totally wrong, but we were apprehensive when we parked in a lot that was on the street and backed to an alley. It’s about 5 when we arrived. We were early and I forgot to mention that we had reservations. Because when we walked in we didn’t see any tables. We saw a long bar and some bench seating along one side. There were a few chairs and small tables in the back, so we headed there. Looking rather confused, someone with the look of manager asked if they could help us. I’m sure we looked totally out of place. We said we were there for dinner. “Do you want to sit here (pointing to the few tables we saw) or in the dining area?” YES! Dining area please??!! In the next room are about 10 + four top tables with a large picture window. It was completely empty. Remember, it was 5 on a Friday. So, that’s okay. 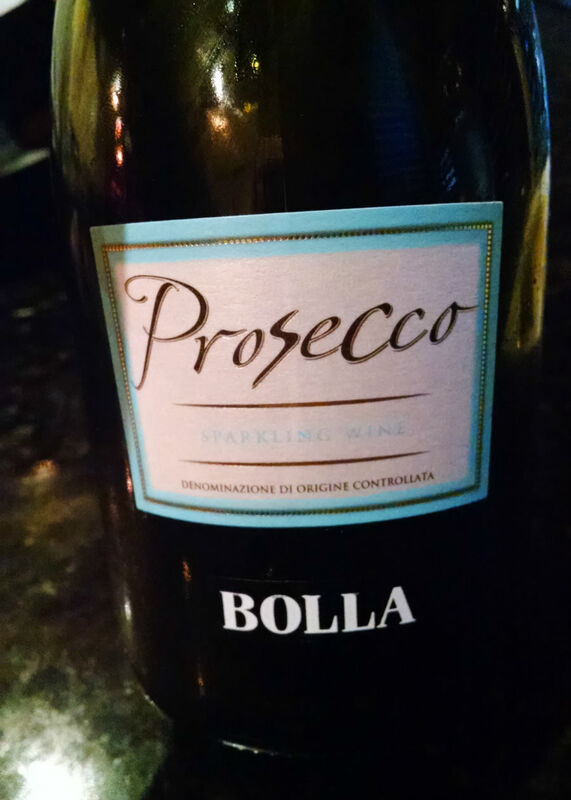 We told Alicia, our server, that we were celebrating and wanted to order a bottle of Prosecco. It was delicious! She was very knowledgeable about the menu and the wines on the menu. She was very personable and funny! Now, for me to remember her names should illustrate how impressive she was; I don’t remember names easily! After a few we ordered the Chilled Tuna Sashimi and the Mussels. Okay. I don’t like sushi. I’ve tried it several times. I usually can’t get past the raw fish taste and the seaweed wrapper. I ate three pieces of the tuna. It was fresh. It was tasty. It was DELICIOUS! And the mussels? To die for. They were in this fabulous, spicy tomato sauce. We wanted to lick the bowl. There wasn’t enough bread because we honestly wanted to eat every last drop of the tomato sauce. It was so good, I’ve tried to recreate it at home. Entrée? S ordered the Soy and Ginger Mahi Mahi and I ordered the infamous 10 ounce Bone-in Pork Chop. Both were amazing. The mahi mahi had a delicious soy and ginger glaze and coated with two kinds of sesame seeds. It was tender, flaky and juicy. He kept giving me pieces to nibble on, but I think that’s because he wanted more bites of my delicious chop! See what I mean? It was perfectly cooked! It was tender, juicy, and tasty. The rub perfectly flavored the grilled meat on the outside and when I cut into it, it just glistened with delicious juiciness! Just fantastic. The potatoes were tender and crispy. The green beans had a delicious smoke grilled flavor to them. It truly was a delicious meal! We didn’t order a dessert, though there were several delicious options on the menu. We had already purchased a cheesecake to nibble on in the room. If you’re in the area, make a reservation, and head to Wine on Third. You won’t be disappointed! We definitely were not! They had this carved pumpkin outside the hotel that we saw when we arrived back to the room. I thought it was pretty cool, so I took a picture of it.Follow on Wine on Third on Facebook, Twitter, and Instagram.